Is it possible to play a 4D first person shooter? Adanaxis may answer that question. We're talking four dimensions of space here, so that's four not including time. 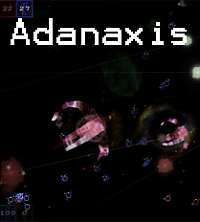 Adanaxis is a space shooter like no other. It takes place in a world entirely different to everyday experience. As well as left/right, up/down and forward/back, there's another direction in space - the fourth dimension. Objects phase in and out as your craft rotates into this hidden dimension. The game uses an all-new 4D texturing method to display the fluid rotations and motion that are possible in four dimensions. All ten degrees of freedom are available for mouse and joystick control, to create an environment different to any other game. A simple scanner system and tutorial make the game easy to pick up. The commercial version of Adanaxis became free in September 2011.